Sitting at the foot of Mt. Shasta, I am filled with the majesty of Divine Presence. This sacred mountain is a vast feminine being filling the horizon and uplifting all in her vortex of power. Mt. Shasta is one of the most holy mountains on Earth, some even call her the Base Chakra of the planet. The expansiveness of beauty in this place and the abundance of Nature, gifted so freely, sparks Divine Love in and through me, and I am filled with wonder at the magnificence of this time. This level of expansive attributes also challenges my ability to bring into conscious awareness what is transpiring around me on the planet right now, as well as through me. The desire to spend a few months in Mt. Shasta was sparked from a soul level. I have needed to find a deeper connection to Nature. These first months of 2012 have felt like being in a whirling vortex and at other times as though I am in a vehicle moving at the trajectory of the speed of Light. My move to Mt. Shasta is all encompassing. One part is to help a friend in a health challenge and to take care of their beautiful dog and house next to the sacred mountain. Because I am here, I am blessed to spend time with a community of very evolved and welcoming souls. Part of this move has to do with more creativity in my work upleveled by Mt. Shasta’s high frequencies, with a chance to complete a book and teach at a new level. Much of my placement here is purely personal as I have been guided to create more of a framework for my feeling center and share that stronger foundation with others. We have all been deeply clearing the old patterns from our lives in order to be ready for this new time we are moving into. I have felt a strong need to live closer to Nature in a sacred place in order to nurture my abilities to receive the vast divine qualities available to all of us right now. Soothing my solar plexus has been essential, as my digestive process seems to be fluctuating with the energy frequencies. I have heard this from others over the past few months, so I know we are all being impacted in our Solar Plexus Chakra. This is our power center where the emotional body is affected by the energies around us that may have triggered old patterns ready to be released. The empowerment of Divine Grace is a powerful tool I can offer to myself so my feeling body has help when it needs to have more ease and safety. I have noticed that when I am having a hard time creating coherent thoughts because of the intensity of energy frequency, the soothing quality of Grace is nurturing a deep need I was not even aware of. Just calling on the sacred quality of Divine Grace to fill my entire being so it can anchor on the planet is a nurturing, soothing and powerful process for me. All will benefit when we bring more Grace to the earth. It seems there is a theme and I am being encouraged to trust the process of my experience. As I open into the new energies around me, I am letting my body recalibrate to be able to function at these higher frequencies. It feels as though my nervous system is being rewired, so it would be best to gracefully allow that to happen. Resisting is not an option. So with surrender in mind, there is nothing to do but enjoy the beauty around me, plant seeds for my future, bless the process and receive the depth of love that is being offered to all of us. All will benefit from this process as our energy work not only blesses our lives but the Earth as well. We just experienced the Wesak Moon on May 5, the most powerful Full Moon of the year, celebrating Buddha’s enlightenment as well as opening a new pathway of Light on the planet. The nonphysical assistance we have access to during these times is brilliant. It was also a 5-5-5 Portal opening to the empowered frequencies of Divine Light energy pouring on to the Earth right now. These will be increasing right through the important 12-12-12 Portal on December 12, 2012. 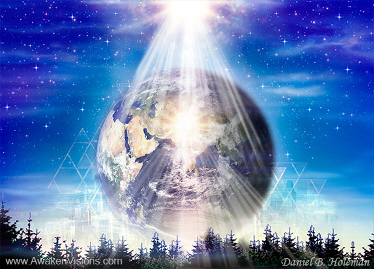 As if we were not already aware of the changes affecting the planet right now, on the New Moon of May 20 a solar eclipse will take place catapulting us into new birth and completion of our past patterns. This eclipse will especially affect the balance of the feminine/masculine energy on Earth and within ourselves. Obviously the old ways do not work in any area of life that relies on our left-brain intellect to make decisions. We are being drawn into making new choices by relying on inspiration from our hearts. Science has recently discovered that our hearts actually contain more intelligence than our brains, so once again spirituality is well ahead of the mainstream in awareness of Truth. To add to this process for bringing more Love into our lives as well as the planet, on June 5 viewed from Earth, Venus will literally transit over the sun. Since the sun empowers new life and Venus carries Divine Love, our lives are deepening into a free flow of Divinity that can move us forward in the direction of our intentional focus. This energy will not be available again in this lifetime. Once there lived a village of creatures along the bottom of a great crystal river. The current of the river swept silently over them all–young and old, rich and poor, good and evil, the current going its own way, knowing only its own crystal self. The other creatures laughed and said, “Fool! Let go, and that current you worship will throw you tumbled and smashed across the rocks and you will die quicker than boredom!” But the one heeded them not, and taking a breath did let go, and at once was tumbled and smashed by the current across the rocks. Yet in time, as the creature refused to cling again, the current lifted him free from the bottom, and he was bruised and hurt no more. And the creatures downstream, to whom he was a stranger, cried, “See a miracle! A creature like ourselves, yet he flies! See the Messiah, come to save us all!” And the one carried in the current said, “I am no more Messiah than you. The river delights to lift us free, if only we dare let go. Our true work is this voyage, this adventure.” But they cried the more, “Savior!” all the while clinging to the rocks, and when they looked again he was gone, and they were left alone making legends of a Savior. To me this is our process right now – to learn to flow with big energy forces, to soothe our emotions with Divine Grace and receive ever more Love from the God Source, trusting our guidance as we let go into the River of Divine Light. That is what 2012 is about. The world will not end on December 21, but it is feeling very different than it ever has before. It’s our job to recognize the frequency of current that helps us feel inspired into heart-centered action and call forth the qualities of consciousness that will make such action possible. How Can I Serve this Process? To assist our personal process of evolution, I was guided in January of 2012 to lead a seven-week course using the techniques I have learned over 40 years of spiritual practice. I called this teleconference Evolution of Consciousness 2012. I knew we were all going to need to operate from a centered base more this year than ever before. At the same time the power of Divine Light amped its frequencies to allow us access to the Christ Consciousness and the Angelic Dimensions. This opened our beings to an expansive new 12-Chakra system connecting us literally from Heaven to Earth directly through our bodies. We need to learn to work with this new energy system for our optimum future lives. Through our seven-week teleconference, Evolution of Consciousness 2012, we used these high frequency alignments to activate the new chakra system, bring more spiritual consciousness into our daily lives, and seed our personal futures as well as the planet with Divine Love. The response from the international group of students was so phenomenal we decided to offer the recordings and class materials so that others would be able to participate. These recordings and materials are now available to purchase. The class members also encouraged me to continue the class for another seven weeks (Phase 2), which we completed the last week of April. Those materials will be available at a later time. This class series with its study materials, is proving to be not only a powerful audio course but some of the most profound work I have been guided to do in this life. We have created a new Gabriel Resource Center to allow you access to the materials I’ve been inspired to make with the assistance of the masters working with me. There is also a free technique that I received from Archangel Gabriel and have used every day for over 20 years. I pray that you will fiind this as empowering as I have. By the end of this week we will offer for the first time, online access to The Gabriel Messages Book and the Gabriel Message Card Set. So many have enjoyed working with these inspiring cards online as their daily message from Archangel Gabriel. Now you will be able to read the expanded message from the book with each message you choose, knowing it speaks to the greater Truth within you. I am grateful to share this work with you in a new exciting way. It gives us the opportunity to create and activate a profound spiritual process together that will assist in bringing forth a new world of Peace, Harmony and Love.